In the 1980s, music defined the moment—“Video Killed the Radio Star” ushered in MTV, “Don’t You (Forget about Me)” ruled The Breakfast Club, and “I Still Haven’t Found What I’m Looking For” became the anthem of a generation. But the era was not just about its distinctive music; it was also the most visually provocative era of the last millennium. Every new vinyl single hit the stands wrapped in an eye-catching sleeve that reflected the latest trends. Put the Needle on the Record: The 1980s at 45 Revolutions Per Minute is pop-culture historian Matthew Chojnacki’s definitive guide to seven- and twelve-inch vinyl single artwork from the ‘80s. From a dream of a vinyl collection, Chojnacki presents and compares more than 250 vinyl single covers that represent nearly every prominent ‘80s musician. However, this is not just a pop-cultural feast for the eyes. From hundreds of hours of interviews, Chojnacki allows the designers and visual talent behind Madonna, Prince, Pink Floyd, Queen, Adam Ant, Iron Maiden, The Clash, Pet Shop Boys, Van Halen, and more to tell the unheard stories behind the decade’s most iconic images. 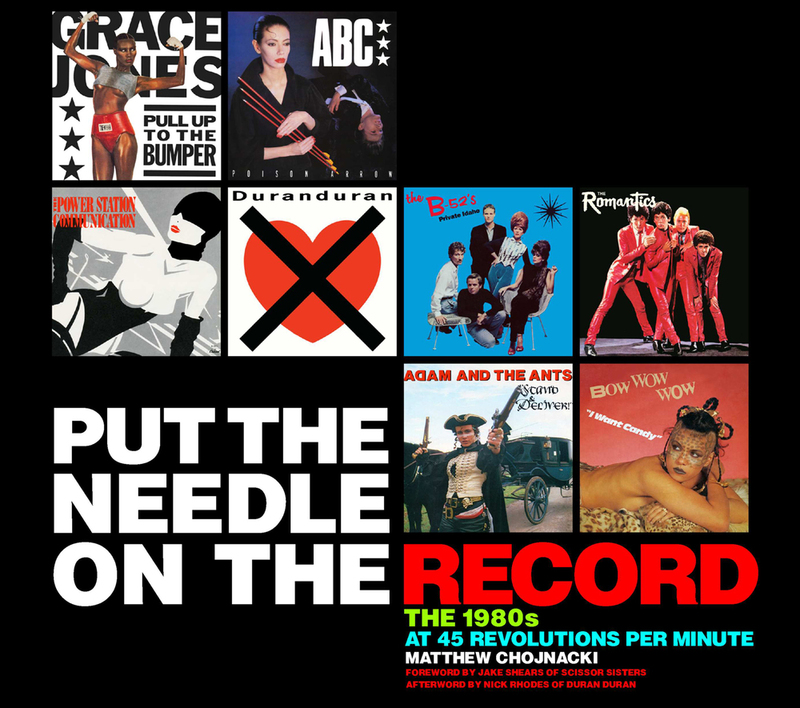 Coupled with exclusive commentary from more than 100 of the ‘80s biggest musicians, including Annie Lennox, Duran Duran, Run-DMC, Devo, The B-52′s, Erasure, The Human League, Scorpions, The Knack, and Yoko Ono, this is an authoritative journey back to the songs and images that continue to influence our culture. Two prominent pop musicians bookend these musical stories: Scissor Sisters’ lead singer Jake Shears introduces Chojnacki’s work, and Nick Rhodes, part of seminal ‘80s pop band Duran Duran, rounds out the collection with the afterword.